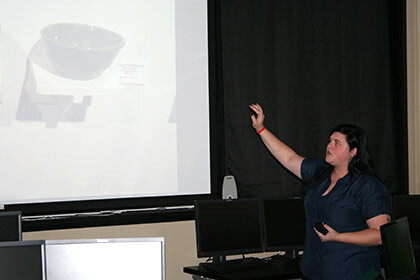 Cowley College art and graphic design students recently had an opportunity to present their work during a portfolio review held in the Kerr Technology Building. The portfolio presentations were held by Cowley College graphic design instructor Mark Dykes and 3-D art instructor Zach Lind. Along with the portfolio presentations, the students also had to interview an artist or designer, schedule a school or workplace visit, make resumes and business cards, and create a web portfolio. “Many of these students have already applied or been accepted into other colleges,” Lind said. Dykes was happy to see the students work diligently on the portfolios. “It was great to see their eyes open to what their potential can be,” Dykes said. Graphic design students that had portfolio reviews were, Bryce Bennett, Rikki Johnson, Jesus Originales, Shayna Templeton, and Tyler Willich. Art students presenting portfolios for review were, Abby Cahn, Sheridon Flottman, Kylee Griffith, Kathleen Hankins, Mamie Manly (pictured above), Marissa Marlowe, Madysn Mitchell, Suzanna Smith, Airiana Trefethen, and Susan Webb.